Two students at a Maryland high school were shot today after a classmate opened fire in the hallway just before the start of classes, according to St. Mary's County Sheriff Tim Cameron. 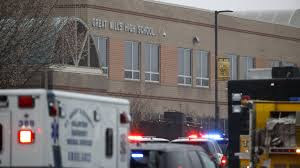 Great Mills High School remained on lockdown after the shooting was "contained" when a school resource officer "engaged" the gunman, St. Mary's County Sheriff Tim Cameron told NBC Washington. The chaos unfolded before 8 a.m. ET when the gunman walked into the 1,600-student school and fired a round at a 16-year-old female student, also hitting a 14-year-old male. The shooter was injured and taken to the hospital, where he later died, officials said. "This is what we train for, this is what we prepare for, and this is what we pray that we never have to do. On this day, we realized our worst nightmare," Cameron said. The White House this month said it will propose funding firearms training for school personnel and bolster firearm background checks, but steered clear of a previous idea floated by President Donald Trump to raise the minimum legal age to buy semiautomatic weapons from 18 to 21.